This is probably what the third-generation Renault Twingo will look like when it's officially revealed next month at the Geneva Motor Show. In keeping with Twingo tradition, it looks silly and fun. But in a twist, it's now a rear-wheel drive, rear-engined, five-door hatch. Crazy, right? Would You Believe This Brilliant Design Is Already 20-Years-Old? Carscoops published leaked photos of the new Twingo before the official unveiling. Some models also get a full-length sliding roof that adds to the Frenchness. And that's good. The looks are based off of last year's Renault Twin'Run concept car, although toned down and with a stubbier nose. That's because the 2015 Twingo, unlike the Twin'Run, only has one engine and it's in the back. This is all because Renault is using the setup destined for a new four-seat Smart and the next-gen Smart ForTwo two-seater, both of which get a rear-drive, rear-engine layout. Despite three-cylinder engines that may only make horsepower in double digits, it could be a little hoot. 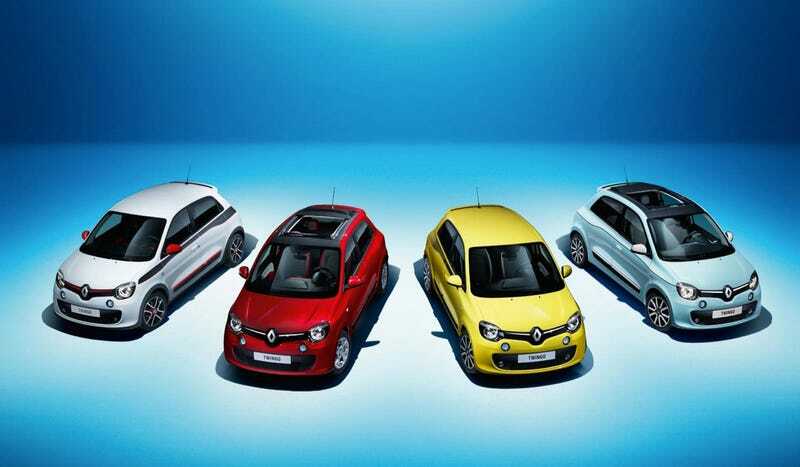 Unfortunately, like the awesome Citroen C4 Cactus we saw last week, Americans will be deprived of the Twingo yet again. At least we can look forward to a small rear-rear car in the form of that new Smart four-door, right? Oh, scratch that.